The Victoria Falls River Lodge quickly established itself as one of the places to stay in Victoria Falls, with an emphasis on taste. Situated on the banks of the Upper Zambezi River, the lodge is the first private concession within the Zambezi National Park in Zimbabwe, upstream of the largest waterfall in the world (you can see the spray in the distance! ), the lodge delivers luxury tented accommodation and fine dining in a stunning setting. 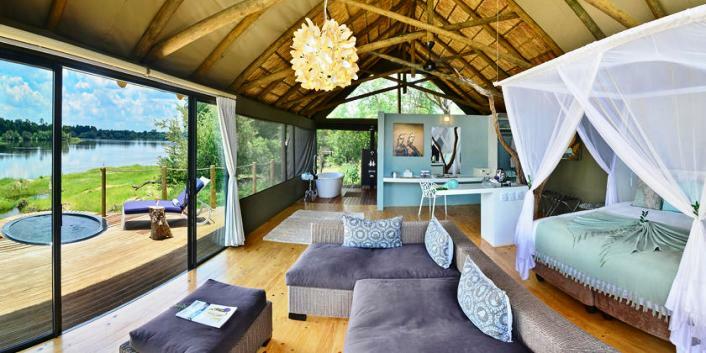 The Park offers game viewing opportunities within a short distance of the Victoria Falls. Wildlife along the river is varied and include good numbers of elephant, buffalo, giraffe, many antelope species and hippopotamus, who spend their day in water to avoid the heat of the sun and come out to feed on the banks of the river at night. The permanent availability of water along the river means that wildlife populations are widely dispersed, but the patient safari goer may even be lucky enough to find leopard, lion, hyena or even wild dog, species which all occur in the region. Reptiles are common, with crocodiles along the river and many species of snake, lizard and skink to be found on land. Birdlife is also diverse, from herons, egrets and storks to weavers, woodpeckers and fish eagles. Victoria Falls River Lodge’s location and luxurious comfort makes it all too easy to relax, enjoy the top quality service and let the wildlife come to you. 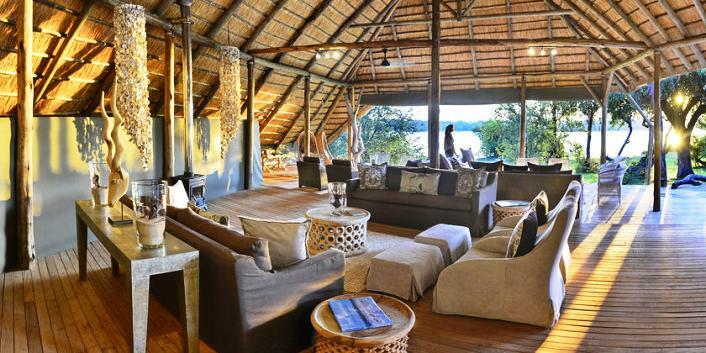 Each luxury tent is carefully situated for its own, unique and private views of the river, decorated in subtle earthly hues, while the central lodge boasts a spacious open plan dining and lounge area with swimming pool. Explore the area through Victoria Falls River Lodge’s organised activities and you will be richly rewarded. 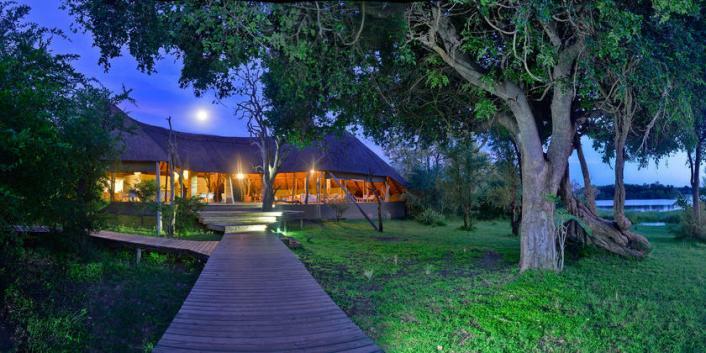 The lodge offers guided game drives within the National Park, including night drives (always recommended), and guided walks by professional safari guides. This concession for walking is particularly good. Sunset river cruises are a must as are the exclusive picnic options on Kandahar Island. This area is also renowned for bird-watching with many endemic species. 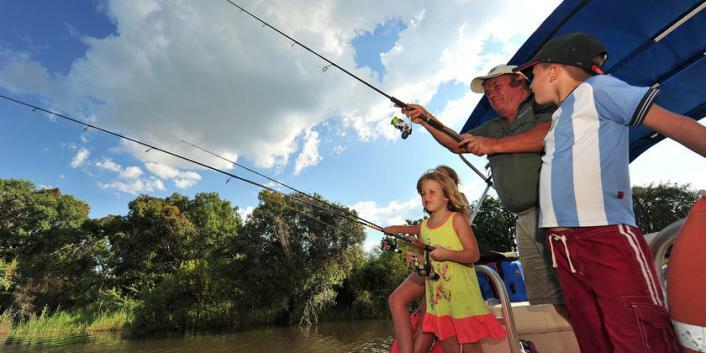 The lodge offers optional boat transfers to and from town. The activities offered, location, luxury and comfort at Victoria Falls River Lodge makes it worth the money you spend there. The Falls themselves are easily accessible too. • Fine dining in the central dining area of main complex. • The Victoria Falls River Lodge is child friendly and special activities, tours or child minding services can all be arranged. Family tents offer an additional tented room, with one single and one double bunk bed, allowing three children to sleep comfortably. 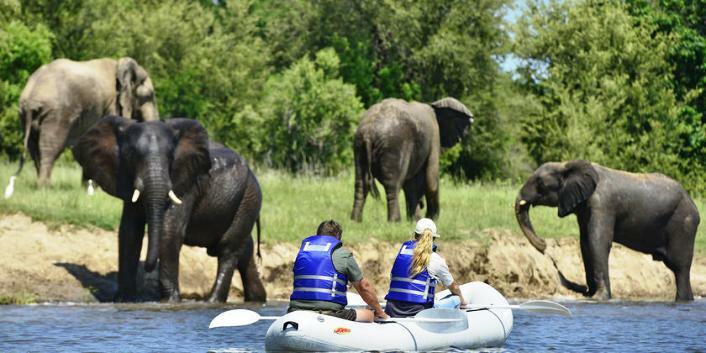 • Two game activities per person per day – game drives/walks in the Zambezi National Park OR a river cruises. •	Bird watching on Kandahar Island. • Self-drivers drive into Zambezi National Park to the location of the lodge. Secure parking is available. • Transfers can be arranged from Kasane and Livingstone airports and towns. Contact us for more information.